This first Meditation is unusual in that it requires you, if possible, to go out and walk in a woodland or forest area. If you are not in proximity to either of these, a local park or any natural area will do. If you live in a very built up area, you can close your eyes and visualise being in a woodland or forest instead. Even if you are in a forest or woodland much of the Meditation involves imagination and visualisation. This is a Walking Meditation, one I began some years ago. I live in a semi-rural area in Kildare, Ireland, the County and homeland of Brigid herself. This Meditation can be done for each of the Seasons or Pagan Festivals. This one is to do with Brigid in her Maiden Form at the beginning of Spring. Even though the 1st of February may have passed, this Meditation is still relevant throughout the early weeks of Spring. Location – A Forest or Woodland with a mixture of Evergreen and Deciduous Trees. The Deciduous Trees are more symbolic of the Wheel of the Year and the changing Seasons as they show definite signs of the yearly cycle of nature. If possible go at a time when it is not crowded with people as noise can be distracting, and you want to be relaxed and focused. I used to drop my son to school and then head straight to the forest with my dog early in the morning. As you begin your walk, just let your mind settle and calm. Do not walk fast. Once you feel centred within, call upon Brigid and ask her to walk with you. Tell her that you have need of her help and you wish to ask for her guidance. Continue to walk slowly, calling upon Brigid. Slowly begin to feel her presence close by and thank her for answering your call. Without making any sudden moves or stopping, slowly turn your head and stare in through the trees beside you on the forest path. The trees are a mixture of Evergreens and Deciduous. Most of the trees look bare and leafless while some are dark green reminding you of Christmas Trees. The Forest Floor is covered in all the old rotting leaves that have fallen from the trees along with broken branches. Ferns grow large with their feathery leaves and you can see forest mushrooms and toadstools at the base of old tree trunks. Some of the trees are very old, while others are young and thin. You wonder what stories the old trees hold secretly within; for they have seen many years come and go. As you continue to walk at a slow and even pace, you now stare up at the sky and notice the thin watery sunlight shining down upon you. There is a chill in the air which the Sun cannot, in its young state take away. 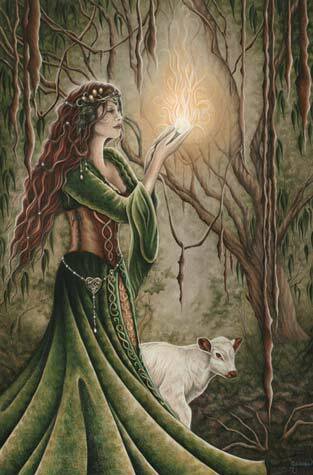 You feel Brigid’s presence grow stronger and look back into the dense forest as you see thin beams of Sunlight piercing through the trees, lighting up the dark areas. Suddenly you notice something moving in the forest and you look closer. You continue to walk and the movement appears to keep pace with you. Staring back into through the trees you cannot believe what you see. There walking slowly through the rays of Sunshine is a young woman in a long white gown over which she wears a pale green cloak which flows out behind her. Her cloak is secured around her neck with what looks like a large golden clasp or broach. Her brilliant thick auburn hair cascades in waves down her back. Her skin is pale in contrast, but radiant and shining. She does not look directly at you as she walks so you cannot see her exact details but you know she is barefooted. She walks proud and tall and you notice that the light around her seems extra bright. She is literally lighting up the forest as she passes through. She stops and looks over her shoulder further into the forest and tilts her head in a nod. Out from the depths of the forest walks a large White Cow with Red Ears (you can replace the White Cow with her traditional two Oxen or if you find them hard to visualise see a White Horse or Unicorn emerge from the trees). The White Cow walks slowly up to the waiting young Maiden and she greets him by gently rubbing her hands down the back of his neck. She turns once more and continues to walk through the trees, her White Cow close behind her. In the cool air, you can see the vapoury haw of his warm breath rise high above him. You begin to notice more movement in the trees as you keep pace with this young woman. Now you can see that other animals have come to join the procession. It seems that all the wild creatures of the forest want to follow her as you pick out rabbits, foxes, badgers and a variety of other smaller animals. The cool morning air becomes alive with birdsong and the flutter of their tiny wings as they too fly around, back and forth, swooping and diving, all following the Maiden with the long Auburn hair. She puts out her hand and little birds land on it. She strokes them ever so gently with her soft fingers before they fly about her head, chirping with joy. You continue to watch in fascination as you walk, feeling privileged to be witnessing the Goddess Brigid herself. From beneath her cloak, she pulls a long White Wand and begins to touch every tree and the forest floor with it as she walks. She is bringing life back to the forestry and its creatures once more with her magical touch and you feel your heart lift with joy. If she can do this for the forest she can help you too. As if she has read your thoughts, you suddenly hear a voice in your head calling you by name and asking what it is you need help with, what is it that you wish to draw to you in life, where do you require growth, progress and inspiration, what is it you want to give birth to? She also asks you where you might need healing. Feeling slightly overwhelmed by her sudden enquiries, you stop walking and turn in to face her. The Goddess Maiden stops exactly at the same time and turns towards you. The White Cow and all the animals watch her expectantly. In your head you hear her call your name once more. She beckons you to come closer. Feeling slightly nervous you leave the forest path and walk slowly in through the trees towards Brigid. As you grow closer to her, you feel heat radiating from her in waves and your skin begins to tingle as if electricity is coursing through your body. You realise you are in the presence of an otherworldly being, a Goddess of great power and strength. You stop a few feet away from her in awe for you can see her more closely now. Her brilliant green eyes observe you closely and curiously. Her pale soft skin shines with the early morning dew. Her lips are the colour of rose and her cheeks glow with youth and vitality. Her body is strong and slim and through her white gown you can see the outline of her young firm breasts. The rays of sunlight catch her brilliant auburn hair turning it to the colour of flame as it flows around her shoulders in long thick wavy strands. She is tall, much taller than you. You can see the detail on her gown and cloak now that you are up close to her. Her white gown is intricately embroidered at the neck and hemline. Around her waist she wears a low slung golden sash that is embroidered in shades of yellow, red and pale green. The embroidery takes the shape of symbols; you know that these represent the gifts she brings with her as the Maiden Aspect of The Triple Goddess. 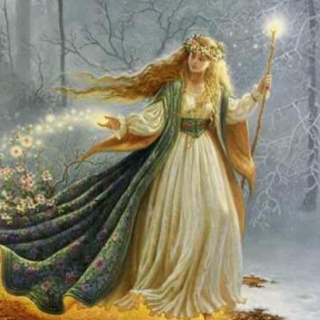 These are the symbols and signs of Brigid, The Maiden Goddess of Spring. No human hands have been involved in the making of this sash for it contains a magic and power that comes from another dimension. The clasp on her cloak is fashioned out of a bronze or gold type metal and it too is carved with the same symbols as her sash. Around her pale neck, hangs a leather-like cord at the end of which holds her Special Cross or Sun wheel. This appears to be made out of a bronze type metal and your eyes become fixated by it. Brigid’s sudden movement brings you out of your hypnotic state. She has moved over to sit on a fallen tree and beckons you with her hand to come and join her. The heat and electricity coming from her grows stronger as you take up a position on the tree beside her. Reaching into her gown once more, she pulls out a handful of reeds and hands them to you. She reaches in once more and pulls out more for herself. You hear her voice in your head talking to you once more. She tells you that she is going to show you how to Craft her Special Cross and that as you weave the reeds she wants you to concentrate on all the areas of your life you want direction and guidance on. She wants you to think of what you might need healing for, where you need her light to shine brightly. She asks you to think also of your family and friends who may also be in need of help. She wants you to be clear about that which you wish to let go of or say goodbye to for her power is very strong. She reminds you that you have invoked her presence, and not the other way around. Therefore, she has answered your call and is here today because she knows you are ready and willing to make any necessary changes that will move you positively forward, leaving all that is old, stale and negative behind to dissipate and disappear. She says she has faith in you realising your potential and achieving any goals you have set for yourself. She tells you that she needs your solemn agreement before the Crafting of the Cross can begin. You reassure her that all your requests have been well thought out and are your deepest heart’s desire. You are ready to leave the past behind, the dark and move confidently forward into the future, the light. Brigid stares deeply into your eyes and beyond into your soul for signs of any hesitation or doubt on your part. For a moment you think she does not believe you or doubts your ability to change or let go of certain things in the past, but she pulls the first reed out and holds it up straight in front of you. She asks you to do the same. Your Crafting of the Cross is about to begin and she tells you that as you weave, she wants you to meditate upon all that you need help with and to think of all your hopes and dreams for your future. She lifts another reed and folds it around the upright one at its midpoint. You follow her lead. As you continue to weave your Cross, you become entranced as you work, as if almost hypnotised. You watch her long slim pale fingers work expertly. Around you stand all the watchful creatures, they too mesmerised by the Maiden’s weaving. Birds sit on low branches so that they can see her work. Before you know it, the Cross has been completed and she shows you how to tie it off at the ends. She praises you for your excellent work and holds hers out to compare it to yours. You can see that Brigid’s Cross has the look of perfection, for she is the Mistress and owner of this knowledge. You look at your Cross and are very happy with your work. You hear her voice in your head once more telling you that your Cross holds strong powers for it has been Crafted with strong intentions. Your Cross now holds the energy of all your hopes and dreams. She tells you to take care of your Cross and to hang it somewhere where you will always see it, and to touch it regularly so that you can re-connect with its energies, and so strengthen your resolve. She leans over and touches your Cross with her delicate fingers. You feel a rush of energy through your body and she smiles knowingly at you. She tells you that she has blessed your Cross and that it will act as a talisman to protect your home and family. Brigid’s work is done with you and she rises from the tree. You follow her lead and rise too. You know that it is time for you to go back out onto the forest path and begin to retrace your steps to where you first began to walk. You thank her with all your heart and take your leave. As you begin your slow walk back, you are aware that she too, and all her animals, walk with you. You glance into the trees every now and then to watch them. You continue to walk, holding your Cross tightly in your hand. Your eyes are drawn to a cluster of snowdrops growing beside the forest path. You are sure they were not there earlier on. You also notice small buds and tiny budding leaves on the nearby trees that had looked barren and bare when you arrived. You realise that this is Brigid’s work and your heart swells with the promise of new-life all around you. You know that Brigid is working the same magic on you and feel so full of confidence, re-energised and so alive. You turn to smile at her but she has moved further into the forestry and you only get the briefest glimpse of her pale green cloak and rich auburn hair before she disappears altogether. You wave and silently wish her well, thanking her for all the blessings she has bestowed on you today. You begin to move now and are eager to get home and find just the right place to hang your Magical Bridgid’s Cross. You feel lighter in your step, with lots to look forward to in the future. Any blues you had have disappeared and you feel filled with positivity, optimism and joy. A healing is taking place with every step you take. 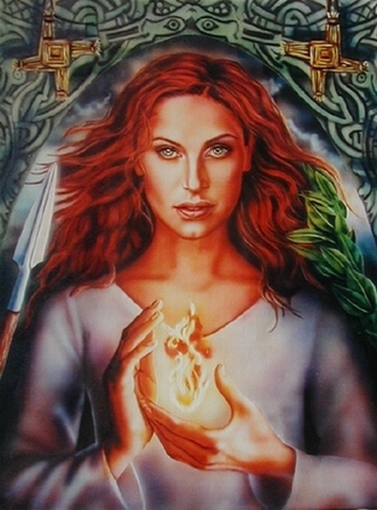 You leave the forest but know that you can call on Brigid again whenever you need her help or guidance. For this Meditation, all you need is a lit candle or fire. Place a white candle in front of you on a table and make yourself comfortable on a nearby chair. Alternatively, light a fire in the hearth and wait for it to burn brightly. Sit close to the fire. Taking nice even deep breaths begin to relax and centre yourself until you feel calm and peaceful. Stare into the flame/s and concentrate on its glowing light for a few minutes. Now silently call upon or invoke Brigid. Wait a few minutes for her to acknowledge her arrival. Keep staring into the fire, watching and waiting. When you are ready close your eyes and you will still see the image of the flame burn. Visualise the flame getting brighter and brighter, its colour more intense and radiant. Out of the flame you begin to see an image forming or emerging from the flame. Brigid has heard your call and answered it. The Goddess seems to be formed out of the flames but you can see her face clearly. Now speak to her of all you need help or inspiration with; your dreams for the future, your plans, your hopes, your ideas. Tell her of all that you need to let go of, or banish out of your life, your thoughts, and emotions. Ask her to bless you, your family and home. Ask her for her help in directing you on the path that is meant for you. Speak to her of your need for healing in certain areas of your life. Keep the image of the Flames and the Goddess Bridgid burning brightly behind your closed eyes. When you are finished thank her and wait for her blessing. Feel the tingle of warm energy rush through your body. Now open your eyes and look back at the flames once more. Sit quietly for a while and reflect on your Meditation. This Meditation is very similar to the first Meditation but does not require you to go outside. It requires only a certain amount of visualisation. However, it does involve you learning how to make a Brigid’s Cross beforehand. Once you have collected all the materials for making your Brigid’s Cross (rushes, reeds, wheat, straw or a suitable substitute), sit down at a table and light a white candle. Take some deep even breaths until you feel relaxed and comfortable. Now call upon Brigid and ask her to work with you as you Craft your Cross. Wait a couple of minutes before starting. As you work, use the same process as outlined in the above two Meditations. Concentrating, focusing and meditating on all that you need help in. Things you want to see grow in your life and things you wish to see disappearing out of your life. 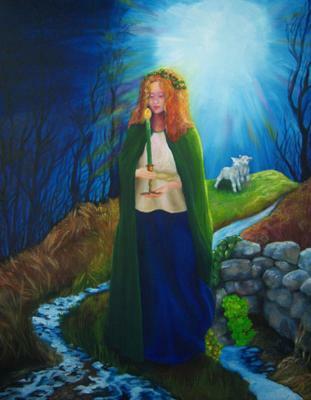 Ask Brigid for blessings for your family, home and friends. Ask for her protection. If you are at a Crossroads, ask her to light up the path that is right for you and guide you in that direction. When you are finished making your Cross hang it up over the fireplace or in the kitchen. Touch your Cross regularly to connect with its energy.